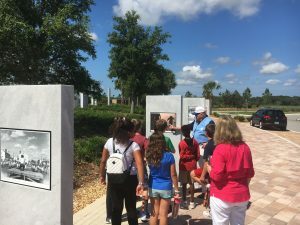 Patriot Plaza Guides are dedicated individuals who lead tours at Patriot Plaza to explain about Sarasota National Cemetery, Patriot Plaza, and the large public art installation. 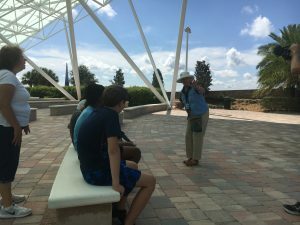 Guides (Docents) will lead tours at the Patriot Plaza for school field trips, the public, and will be able to answer questions as needed at events and other times. To be considered for the Patriot Plaza Guide Training Program, one must successfully complete the entire online application and screening process. Once materials are carefully reviewed, candidates will receive notification and more detailed information regarding the next steps. 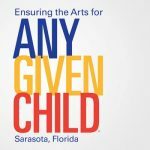 Guide Candidates can expect to participate in at least 10 hours of training with the Arts and Cultural Alliance. Candidates should also plan to spend additional time in self-study, reading and homework outside of the regular training sessions. 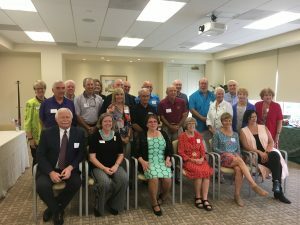 Guide Candidates will also be expected to attend General Meetings held for Guides during the year by the Arts and Cultural Alliance. Additional training sessions will be scheduled as needed. There is no fee to enroll in the Guide Training Program. Your support of the Patriot Plaza through your donation of time and talent is greatly appreciated!